This was the only dress I based on a specific bird subspecies. I knew I wanted to so the Red Throated Hummingbird from the start. 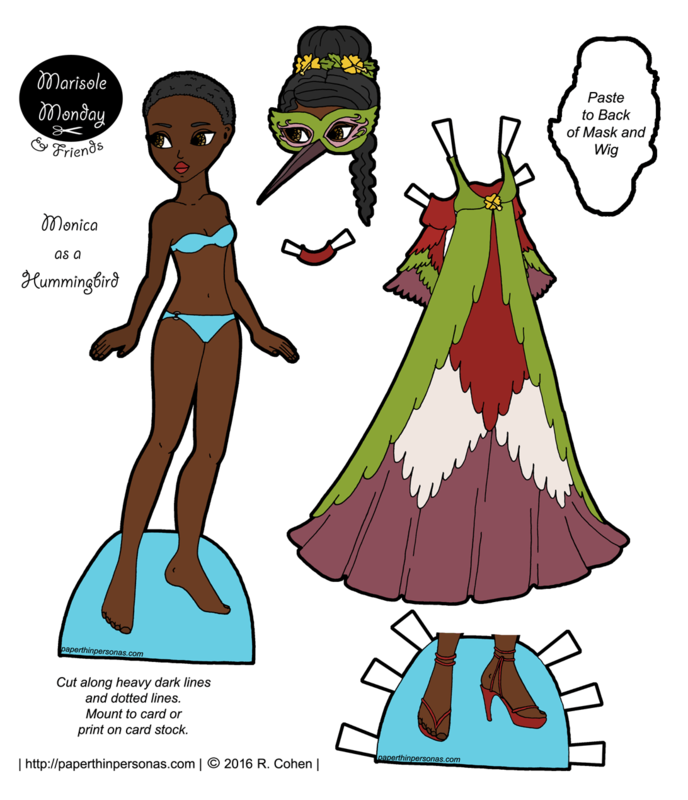 Hummingbirds come in so many color combinations, I really felt like I had to pick just one to focus on with this paper doll masquerade gown modeled by the wonderful Monica. Of course, the choker is red to match the red throat of the hummingbird. The flowers decorating the wig and the gown are yellow hibiscus which are a hummingbird friendly flower. If my Raven masquerade gown was a gothic fantasy, than this gown is much more romantic and soft. I have some wig instructions if you’re not sure how to make the pocket by pasting on the backing piece. Read them here. If you like the blog, please think about supporting it on Patreon and/or following it on Twitter-@paperpersonas. Tomorrow will be the last bird masquerade gown- a gown based on the Loon. each mask has so much personality! Thank you. The beaks were hard. I tried to match each to the bird, but that was tough. Love the masquerades this week! They’re so cute, with a touch of mystery and mischief. I will totally take mysterious and mischievous, both I think apply. I love how these costumes so much. 🙂 The mask for the hummingbird is so cute. I’m so glad you like her mask. I was a little scared that the super long beak would be a problem.